Welcome to Free Chat Online. The online Free Chat Online is the community where you can connect and make new love and friends from around the world. Join The Best And Become A Member Of Free Chat Online. Free Chat Online connects you with new people nearby or all over the world! 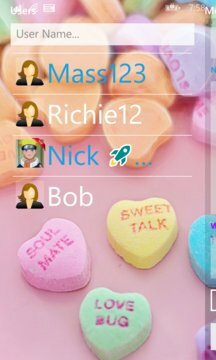 Download this free Free Chat Online app to meet and chat with men and women based on search parameters that you set. Chat with new friends, give gifts, share photos and more! Free Chat Online matches you with people you want to chat with, whether they’re nearby or in a city you want to visit. Have fun and meet people from all over the world with this free fun chat app. No registration needed, you can start chatting right away! There are always people online and you will never feel lonely. Simply run the app and start chatting! 100% anonymous, fast and fun, Free Chat Online app is the easiest chat app to use.